To get on your shoulders turn your upper arms out and have your palms face up. 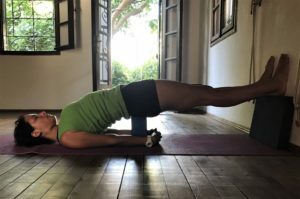 Lift hips and sternum. Chin away from chest. Tongue soft. This classic pose has so many variations. You can do it actively and strengthen the backside of your body: triceps, all back muscles, buttocks, hamstrings, calves. You can also do it passively and restore your body and mind. 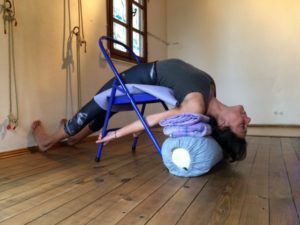 The framework of this pose is: shoulders rest on floor, blankets or bolster. Sternum is lifted. Abs are parallel to the floor which means it can be practiced during menstruation. Upper thighs rotate inwardly. The facial muscles and the tongue are relaxed. I raised my shoulders and feet appr 15cm. This helps to come more on the shoulders and to be able to lift the sternum even higher. Like this the neck is released and the chin can easily drop back. Lying with your whole body supported in this pose is heaven. Neck and lower back are long which stimulates the parasympathetic nervous system. The thoracic spine is held in a backward stretch which stimulates the sympathetic nervous system. Legs may not flop outwards and need to be tied to ensure an inner rotation to the thighs which helps to create space in the Sj-joint. Shoulders need to touch the floor. Pelvis rests on block and the soles of the feet touch the wall. Facial muscles are relaxed. Partially, because she is holding to the legs of the chair and actively rotates the thighs inwardly. At the same time her back, neck, shoulders and head are supported. The student in the back needed to raise her legs onto a chair because she felt a twinge in her lower back. We could say, she's resting in supported shoulderstand. We placed a mat on the 4 bolsters. 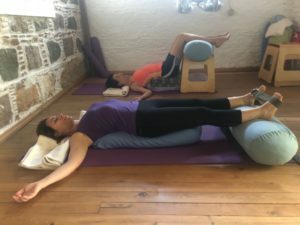 So when she was sliding backwards down into the pose, the skin of her back was stretched and this helped her to create a safe and comfortable backwards stretch.